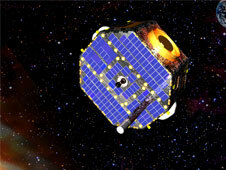 NASA's IBEX, the Interstellar Boundary Explorer, is a mission to explore the boundary between the heliosphere and interstellar space. The heliosphere is the region of space where our Sun reigns, swept out by the solar wind, while interstellar space is full of the interstellar gas and dust that pervades our galaxy. Another cool thing about IBEX is that it's a lightweight spacecraft launched on Pegasus, a small air-launched rocket. But Pegasus is a dinky little rocket. Considering that the Voyager spacecrafts took almost three decades to reach the termination shock, and that it should take them a couple of more decades to reach the edge of the heliosphere, there's no way Pegasus could propel IBEX to the boundary in a reasonable amount of time. So it got me wondering just how IBEX is supposed to explore the heliosphere without actually getting there. IBEX explores the heliosphere by observing incoming energetic neutral atoms, which are, well, electrically neutral atoms with high kinetic energy. Our Sun emits a solar wind outwards throughout the Solar System. Much of the solar wind is made up of very fast-moving protons. When these protons hit atoms in interstellar space at the boundary of the heliosphere, sometimes they strip electrons from the atoms and bounce back at high speed towards the Solar System. Of course, a proton combined with an electron is just an electrically neutral hydrogen atom, so as it heads inwards, its path and speed are unaffected by the magnetic fields that pervade our Solar System. These electrically neutral hydrogen atoms that return from the edge of the heliosphere at high speed are also called energetic neutral atoms. It is these energetic neutral atoms that IBEX detects. By measuring from which direction each atom comes from in addition to their mass and incoming speed, IBEX can give us a map of the sky showing what happens at the boundary between our Solar System and interstellar space. And while IBEX would not be able to directly measure how far each atom comes from, I suspect scientists will be able to make a good guess at the shape of the heliosphere based on the density and speed of the energetic neutral atoms. So if you wondered how many decades it would take for the Interstellar Boundary Explorer to reach the interstellar boundary, you need wonder no more. The answer is "never": it doesn't explore the boundary by actually going there, but rather by observing the particles that originate from the boundary. For a small spacecraft about the size of a bus tire that was launched on the cheap, that's not bad at all. Unless disaster strikes, we should be able to get an actual look at what the boundary is like in a few years on a much larger scale than the mere two locations we have data on from the Voyager spacecrafts.